of keystrokes or mouse clicks. If you want to move the cursor down one line, simply say: Down One. What is Speech Recognition? What is Voice Recognition? These are exciting technologies that change the way you interact with your computer. Now you can speak to your computer and it can speak back. The speech that you and your computer exchange is scripted. In other words, you can't just ask your computer how he/she is feeling? 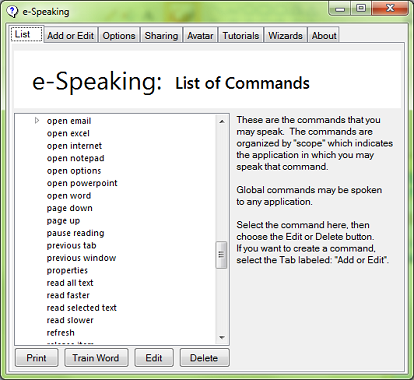 Rather, you can talk to your computer using a set of pre-defined commands and instructions (i.e., a script). Your computer will respond in the same way (also using a scripted language). For example, you can say: "File Open", and the computer would respond: "Select the file". Or you can say: "Edit Find" and the computer would ask: "Find What?". Why speak to your computer? People have been speaking to each other for tens of thousands of years. Our brains have evolved to perform a fantastic and complex set of analyses of auditory input (i.e., sounds). Our brains convert the sounds we hear into conceptual ideas and thoughts which in turn form the basis of instructions, commands, information, and entertainment. Though the computer is just beginning its evolution in this area, most computers are capable of hearing your speech and acting on it. This is the promise of voice recognition technology today. Using speech to interact with your computer--both you speaking to your computer and your computer speaking back. we have developed a very small and efficient voice command and recognition application. SAPI and .NET are both required to use this software. through your voice. To enable you to have access to dictation software using Microsoft's SAPI speech engine. And to allow the computer to read documents and emails to you. It is Shareware. That means: You can download it and try it out for 30 days to see if you like it. The 30 day trial period is Free! That's right. You can download it with over 100 built-in commands and begin using it today at no cost. If you really like the program and want to use it beyond the first 30 days, the cost is $14. Speech Recognition is a technology that allows the computer to identify and understand words spoken by a person using a microphone. The ultimate goal of the technology is to be able to produce a system that can recognize with 100% accuracy all words that are spoken by any person.